The center statue is Buddha Shakyamuni, the founder of Buddhism, who was born to King Shudodhana and Queen Mayadevi at Lumbini, 2561 years ago. Of the 1002 Buddhas who will come to this world during this Fortunate Aeon, he is considered the fourth. At the young age of 29, leaving the luxuries of the palace, Prince Siddhartha (his childhood name) set out to search for an everlasting solution to end the cycle of birth and death that has tormented all beings from time immemorial. After many years of serious practice, he attained enlightenment under the Bodhi Tree in Bodh Gaya and became a Buddha (One Who Knows Reality). For more than forty years, he turned the three great wheels of Dharma in order to deliver beings from the mire of suffering, and to help them reach their full potential and attain supreme enlightenment. The variety of teachings that Lord Buddha gave to suit the different mentalities of beings can be simply condensed into the profound view of interdependence of all phenomena and the conduct of non-violence (ahimsa). The middle way approach of Buddhist teachings have inspired millions in the past and are continuing to do so even to this day. 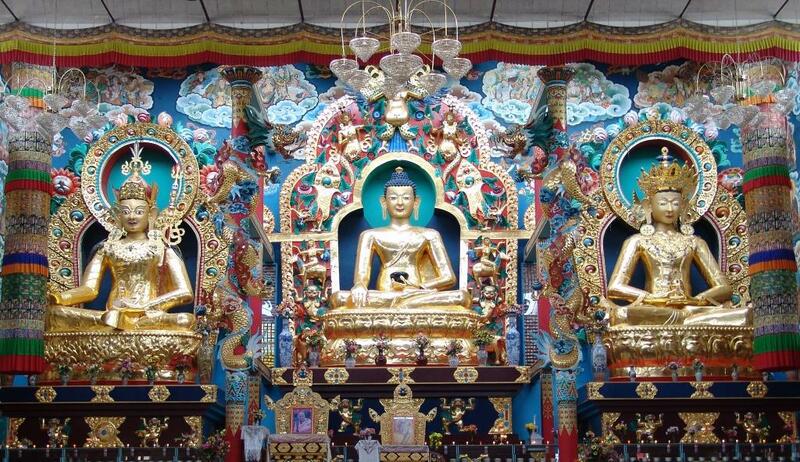 The statue to the left of Buddha Shakyamuni is Guru Padmasambhava, also known as Guru Rinpoche. As prophesied by Lord Buddha, Guru Rinpoche was born twelve years after the passing of Lord Buddha, on Lake Sindhu, in the land of Oddiyana (the present day Afghan-Pakistan border). He is considered to be the heart emanation of Buddha Amitabha. He excelled in the esoteric teachings of Vajrayana Buddhism. During the eighth century, Trisong Deutsen, the 38 th King of Tibet invited him to Tibet in order to establish Buddhism in the Land of Snow. Through Guru Rinpoche’s power, the evil spirits that hindered the establishment of Buddhism were subdued. Guru Rinpoche resided in Tibet for 53 years and 3 months. Guru Rinpoche not only gave various esoteric and secret Tantra teachings through his immense compassion for the beings of Tibet, but also concealed many treasures for the benefit of future generations; thus benefiting the beings of Tibet in the past, present and future. As such, all Tibetans consider him to be extraordinarily kind and revere him as the Second Buddha. the name of Buddha Amitayus will have the length of his or her life extended. When beings are nearing death, if they touch the letters of his name, recite his name and mantra, or praise his qualities, their life spans will be extended. Great benefits are thus derived from constructing the statue of Buddha Amitayus, which protects us from evil and demonic harms, bringing long life to the genuine worshippers and bestowing blessings to the places where the statues are positioned. Such places also become the powerful supports for practising Dharma. * The statue of Lord Buddha is 60ft. in height (from the base), whereas the height of the other two statues of Guru Padmasambhava and Buddha Amitayus is 58 ft. They are made out of copper gilded with gold. Inside the statues are scriptures, relics of great beings, small clay mould stupas and small statues, which symbolize the body, speech and mind of the Buddhas. Seeing these statues, venerating, circumambulating and making offerings to them generates faith, peace, wisdom, loving kindness and compassion in our minds and cleanses unwholesome thoughts and actions.